The same great granular salt you love in our pouches and shakers, now available in bulk. Perfect for food storage. FLAVOR - Real Salt is unlike any salt on earth. It's subtly sweet, never bitter sea salt that makes every bite delicious. First try Real Salt, then try any other salt. The difference will amaze you! MINED IN USA - Mined in Utah since 1958 from an ancient seabed protected from modern pollution. 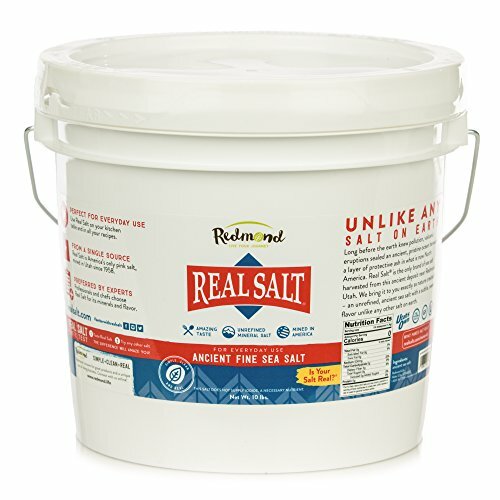 Compared to Himalayan, Celtic, Tibetan, Malaysian, French, Hawaiian, Irish, and Marine Sea Salts, Real Salt means fewer food miles, ethical labor standards, and sustainable practices along with its addictive sweet-salt taste. The only American Pink and Black Salt.